Sitting down could be killing you slowly. If not, it still could be having some serious health implications. According to a scientific study published in the American Journal of Epidemiology, the average person spends more than half of his or her waking hours in an inactive sedentary state (watching TV, commuting to and from work, sitting at a computer, etc). According to another scientific report published in the medical journal, Current Cardiovascular Risk Rep, sitting too much can be as harmful as secondhand smoking. The researchers suggest that, in the future, too much sitting might be considered in the same way as have other insidious environmental and behavioral health hazards. The act of sitting may seem relatively harmless. The average person does it for hours at a time every single day. It’s comfortable, it’s convenient, it allows us to focus on our work or binge on Netflix episodes of our favorite show. But scientific studies found that too much sitting is linked to higher chances of untimely death. In fact, sitting down for prolonged periods of time is linked to chronic back pain, poor posture, and even potentially deadly diseases such as diabetes, kidney disease, heart disease, and obesity. 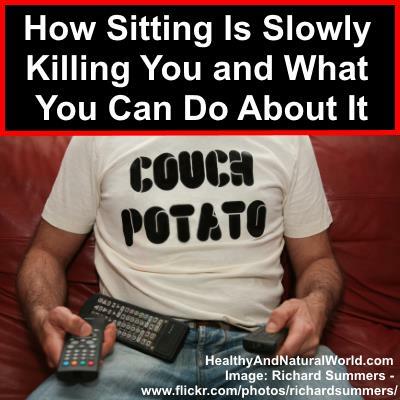 One scientific review concluded that sedentary behavior could be related to premature death. Think of yourself as an animal, because essentially you are. Before civilization there weren’t comfortable recliners to lounge in, computer chairs to spin around the office, or sofas to fall into and waste a day away. Nearly 150 years ago, people spent nearly 90% of their day moving around. In contemporary society, we lounge on our butts for approximately 60% of the day. There are many different reasons too much sitting is bad for you, let’s start with some of the basic and obvious ones. There’s no real nutritional or physical science needed here; simply reducing the time spent sitting will reduce the likeliness of weight gain, especially in a society with such available and unhealthy food. There has also been research at an Energy Metabolism Laboratory that suggests a link between sitting and an increased appetite. Sitting not only decreases your ability to burn calories, it increases your tendency to consume them. Adapting simple tweaks for weight loss is also one of the 70 habits featured in my e-book 70 Powerful Habits For A Great Health which will guide you how to take positive steps to improve your wellness and overall health. Got a lot of back pain? Feel sluggish and tight? Sitting down is far from yoga, and it isn’t doing your body any favors. Too much of it over long periods of time might cause future back problems, especially if done with poor posture. It can also cause pain in your sit bone (also called ischial tuberosity) which is located at the bottom of your pelvis and is the bone that you sit on. Read my articles about the best exercises to strengthen your back and reduce back pain, and the best exercises to improve your posture. Sitting for long periods of time has been linked to the development of kidney disease, according to a study published in the American Journal of Kidney Diseases. “While this study confirms the growing body of literature that supports a link between lifestyle factors and the development of chronic kidney disease, it also adds to the evidence that simply sitting less may have important health benefits.” said lead researcher Thomas Yates, MD, of the University of Leicester and the University Hospitals of Leicester NHS Trust. There are a ton of diseases (some doctors estimate well over 20) that are linked to sitting, but the most surprising one is simply death. Of the many studies that have surfaced in recent years concerning the human habit of excessive sitting, the most shocking are the many linking long bouts of sitting to a higher mortality rate. Both men and women have been analyzed, and each gender has shown a longer lifeline when they spent more time standing and being active. It’s difficult to simply stop sitting altogether. Our society demands it. We have work and education to deal with, and it doesn’t always seem possible to avoid chairs. First, people should realize that exercising is good, but it doesn’t eliminate the health risks associated with excessive sitting. Many of the people observed in the studies above still suffered negative health impacts of sitting despite short bouts of activity. While a 30-minute jog will help, it doesn’t counteract all the hours you spend in a chair afterward. 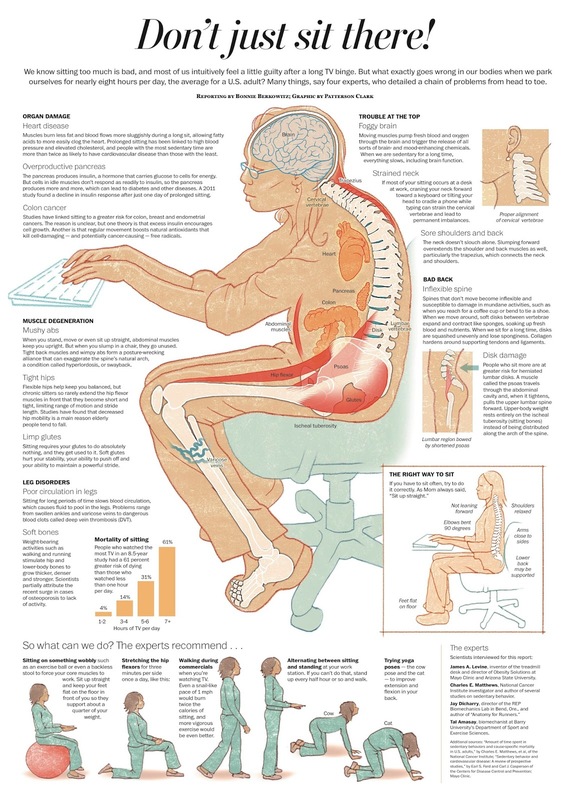 So start to move your body more often and reduce your overall sitting time. One evolving trend is standing desks at the workplace. It may seem odd, but there are a ton of great incentives once your body has adjusted to standing during the day. People who use standing desks have noted higher productivity and energy throughout the day. Over time the shift from office chair to standing begins to feel more natural and you’ll be less likely to want to sit outside of work. You can take things a step further and get a treadmill desk to boost the calories you burn. Other people simply set alarms or reminders during the day to periodically get up and move around to break up long bouts of sitting. Be wary of hobbies that encourage sitting, such as video games and television. These can still be enjoyed with little health implications if you do them standing, or on a treadmill, but many people claim outdoor walks are the best way to unwind and forget about the harmful habit we’ve become so accustomed to.